Video lessons with examples and solutions to help High School students learn to use the law of cosines. The Law of Cosines relates the lengths of the sides of a triangle with the cosine of one of its angles. The Law of Cosines is also sometimes called the Cosine Rule or Cosine Formula. If we are given two sides and an included angle (SAS) or three sides (SSS) then we can use the Law of Cosines to solve the triangle i.e. to find all the unknown sides and angles. We can use the Law of Sines to solve triangles when we are given two angles and a side (AAS or ASA) or two sides and a non-included angle (SSA). The following diagram shows the Law of Cosines. Scroll down the page if you need more examples and solutions on how to use the Law of Cosines and how to proof the Law of Cosines. Solve triangle PQR in which p = 6.5 cm, q = 7.4 cm and ∠R = 58°. In triangle ABC, a = 9 cm, b = 10 cm and c = 13 cm. Find the size of the largest angle. The largest angle is the one facing the longest side, i.e. C.
How to use the cosine rule? One given SAS and the other given SSS. Using Law of Cosines to solve triangles given 3 sides (SSS) and 2 sides and the angle in between (SAS). How to solve an oblique triangle given SSS using the Law of Cosines? Solve the triangle using the information given. 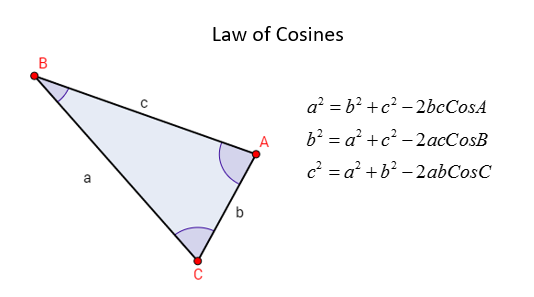 How to prove the law of cosines by using coordinate geometry and the Pythagorean theorem? How to solve two word problems using the Law of Cosine? An engineering firm decides to bid on a proposed tunnel through a mountain. Find how long is the tunnel and the bid amount. Find the range of service of a transmission tower. How to use the Law of Cosines to determine the length across the lake? A pilot flies in a straight path for 1 h 30 min. She then makes a course correction, heading 8 degrees to the left and flies 2 h in the new direction. If she maintains a constant speed of 450 mi/h, how far is she from her starting position?